Halloween is just around the corner, and it is the right time to enjoy adorable treats and have all-around fun. Is your sweet tooth craving for some hauntingly delicious Chocolate recipes? Then look no further. In your pursuit of chocolate recipes, here are some of the tastiest creations that will surely satisfy your sweet cravings. Read on for some great Halloween food ideas and Halloween recipes. When it comes to intense richness from melted chocolate, cocoa, and chopped walnuts, this Halloween recipe is a must-try. 3/4 cup of all-purpose flour, 3/4 cup unsweetened cocoa, 1 cup granulated sugar, 1/2 cup packed brown sugar, 1/3 cup fat-free milk, 1/2 tsp. baking powder, 1/4 tsp. salt, 6 tbsp. melted butter, 1 cup bittersweet chocolate chunks (divided), 2 large eggs (lightly beaten), 1/2 cup chopped walnuts (divided), 1 tsp. vanilla extract, cooking spray. Preheat your oven to 350 degrees Fahrenheit. Lightly spoon the flour into dry measuring cups and level with a knife. Combine flour with granulated sugar, brown sugar, cocoa, baking powder, and salt in a large bowl. Microwave a combination of 1/2 cup chocolate and milk at high for 1 minute in a microwave-safe-bowl. Stir after 30 seconds. Mix in the butter, eggs, and vanilla. Stir and combine the milk mixture, 1/2 cup chocolate, and 1/4 cup nuts to the flour mixture. Coat a 9-inch square metal baking pan with cooking spray and pour in the batter. Sprinkle the remaining 1/4 cup nuts. Bake at 350 degrees Fahrenheit for 22 minutes. Cool the pan on a wire rack. Cut around 20 pieces. 2 tsp. all-purpose flour, 2 cups (9 ounces) all-purpose flour, 1 tsp. baking soda, 2 cups granulated sugar, 1 tsp. cinnamon (ground), 3/4 cup water, 1/4 tsp. salt, 1/2 cup butter, 1/2 cup unsweetened cocoa (divided), 1 tbsp. vanilla extract (divided), 1/2 cup low-fat buttermilk, 2 large eggs, 1/3 cup fat-free milk, 6 tbsp. butter, 3 cups powdered sugar, 1/4 cup chopped pecans (toasted), cooking spray. Preheat your oven to 375 degrees Fahrenheit. Set aside a 15 x 10 jelly-roll pan coated with cooking spray. Dust it with 2 tsp. flour. Lightly spoon the 2 cups (9 ounces) of flour into measuring cups and level with a knife. Combine the flour with granulated sugar, baking soda, ground cinnamon, and salt in a large bowl. Combine 3/4 cup of water, 1/2 cup of butter, and 1/4 cup cocoa in a saucepan. Stir frequently and bring to a boil. Pour this into the flour mixture. Using a mixer, beat at medium speed until the mixture is blended well. Add 1 tsp. vanilla, buttermilk, and eggs. Beat well. Pour the batter into the prepared pan. Bake at 375 degrees Fahrenheit for 17 minutes. Place on a wire rack. Combine the 6 tbsp. butter, fat-free milk, and 1/4 cup cocoa in a saucepan. Bring to a boil, stirring constantly. Remove this from heat. Gradually stir in powdered sugar. Add and stir 2 tsp. vanilla and pecans. Spread over hot cake. Cool completely on wire rack. This simple chocolate indulgence recipe with Frangelico is a super Halloween dessert. 1/3 cup half-and-half, 8 ounces semisweet chocolate (chopped), 1/4 cup fat-free milk, 2 tbsp. dark corn syrup, 1 1/4 cups sifted powdered sugar, 2 tbsp. Frangelico (hazlenut-flavored liqueur), 2 cups small strawberries (quartered), 4 cups (1-inch) cubed angel food cake. Combine 1/3 cup of half-and-half, fat-free milk, and semisweet chocolate in a saucepan. Cook over medium-low heat until smooth (for 5 minutes), stirring constantly. Stir in the sugar and syrup. Cook until mixture is smooth, stirring constantly (or around 10 minutes). Stir in the liqueur. Pour into the fondue pot. Keep warm over a low flame. Serve with cake and strawberries. This Halloween give yourself more reasons to celebrate with these chocolate recipes. Make Halloween celebrations sweet and sinful with these super dessert recipes. 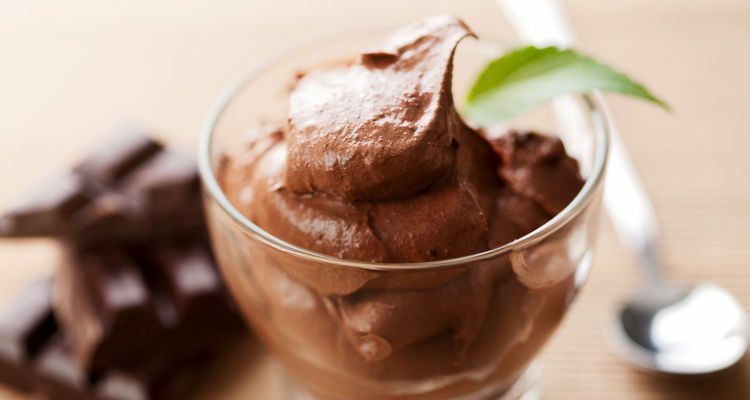 “16 Best Chocolate Recipes,” CookingLight web site; http://www.cookinglight.com/food/top-rated-recipes/best-chocolate-recipes, last accessed October 27, 2016.